(b) Central Board of Excise and Customs. The Customs administration vests with the Central Board for Excise and Customs, which shapes the policy and decides the customs formalities in the country, in terms of the provisions of the Customs Act 1962. All goods imported in India have to pass through the customs clearance after they cross the Indian border. The goods so imported are examined, appraised, assessed, evaluated and then allowed to be taken out of customs charge for use by the importer. (a) Import Manifest: As per the section 30 of the Customs Act, 1962, the persons in charge of a conveyance carrying imported goods should hand over, within 24 hours of the arrival of the conveyance, an import manifest to the customs. The import manifest is a complete list of all items the conveyance carries on board, including those to be transshipped and those to be carried to the subsequent ports of call. (b) Entry in the Import Department of Customs House: On receipt of information regarding the arrival of the goods, the importers or their agents information to make an entry by filing a Bill of Entry, in a prescribed form in the Imports Department of Customs House. The date of presentation of Bill of Entry is an important date as the rate of duty applicable to the imported goods will be the rate, which is in force on the date of presentation. Original Bill of Lading and its non-negotiable copy. Two copies of Packing List. Delivery order issued by the Shipping company or its agent. A declaration from importer that he has not paid any commission to agents in India. Catalogue/drawing, etc for machinery imported. If certificate. items are imported — Textile Commissioner's endorsement or certificate. If the above documents furnished b the importer are found to be adequate for acceptance of the declared value and determination of classification and acceptance of ITC Licence, the Bill of Entry is completed by the Appraiser. it is then countersigned by the Assistant Collector and sent to the Licence Section with an order to the Dock Staff for examination of goods before clearance. 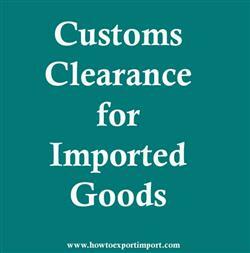 (d) Clearance of Goods: After payment of duty (the original copy of Bill of Entry is retained in the Customs House) the importer should obtain the duplicate copy of Bill of Entry on which order for examination of the goods is given by Customs and get the goods examined. If the description of goods is found to be correct, on the basis of declared and accepted particulars, clearance of goods is allowed by the appraiser. (e) Warehousing the Goods: The imported goods can be warehoused at the port of shipment without the payment of duty by presenting a "Bill of Entry for Warehousing" to the Bonds Department along with a bond for twice the amount of duty payable. Initially the facility is granted for 3 months, which may be extended upto a period one year. The warehoused goods can be cleared in one or more instalments. For clearance of goods from the warehouse, the importer is required to present what is known as 'Ex-bond Bill of Entry'. (d) Import Follow-up: Once an importer is allowed to remit foreign exchange out of the country he has an obligation to import the permitted goods of equivalent value in the country. If no goods or goods for lesser values are imported, it would lead to leakage of foreign exchange. selvaa: On 01 June 2017 I want to IMPORT .177 air gun pellets for SPORTS PURPOSE from GERMANY MANUFACTURER. Please suggest me the process.